Having to bake so many cakes Regularly, I was kinda feeling lazy. It might also be lacking of surprise element to the birthday celebration. 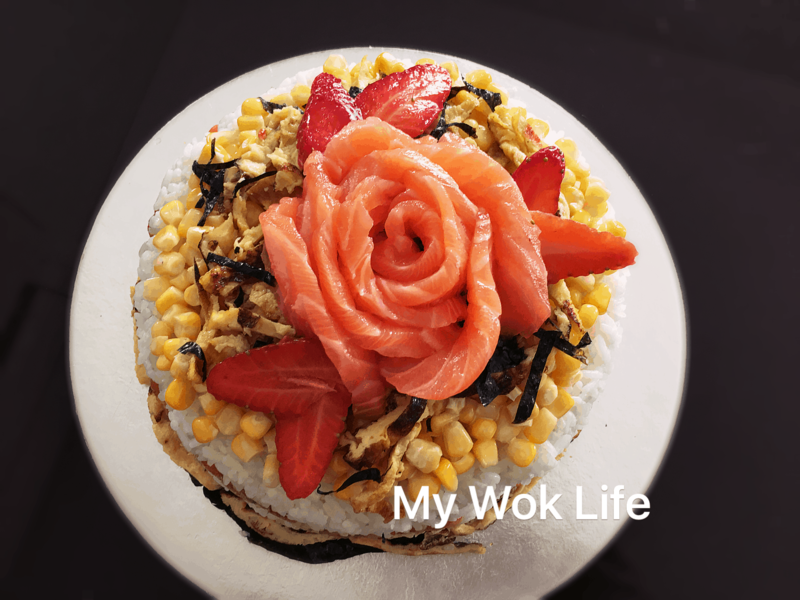 Making a sushi cake not only special, sushi is also our favorite food, especially with salmon as its filling. Hence, I decided to make this as a birthday surprise, at the same time, our quick and simple dinner meal. I thought this was the best simple celebration to mark this day. (1) Cook Japanese rice according to directions of the brand and type of rice you chose. In the meantime, Mix vinegar, sugar and Mirin in a bowl. Once rice is cooked, fold in vinegar mixture. Switch off rice cooker, let rice cool. (2) 1st layer filling: Mix salmon sashimi with the seasonings. Combine well and keep in refrigerator for later. (3) 2nd layer filling: Pan fry salmon fillet with olive oil over medium heat, until both sides are browned. Lower heat, drizzle light soy sauce, Mirin and sugar. Use spatula to chop and shred the salmon fillet while combining with the sauce. Continue cooking until sauce dries up. Heat off. Set aside. (4) Topping of corn kernel: Mix corn kernel with butter and mayonnaise. Set aside. (5) Topping of egg (Tamago): Beat egg into bowl, add milk and sugar. Mix well. Drizzle thin layer of egg mixture in non-stick frying pan and cook over low heat. Shred egg omelette. Set aside. (6) To assemble: Line cake pan with cling wrap. Scope rice into pan and lightly press rice against pan base to set shape and even out rice surface. Lay a sheet of round seaweed piece. Spread spicy raw salmon evenly. (7) Top another layer of rice with the same method. Lay a sheet of round seaweed. Spread shredded teriyaki salmon. Top with layer of rice. Lightly press the rice surface. Lay the last sheet of round seaweed on top. (8) Take cake base to cover to top of the pan and carefully flip over whole pan. Remove pan and cling wrap. Spread mayo corn kernel on the rice topping, followed by shredded egg only on the center part. 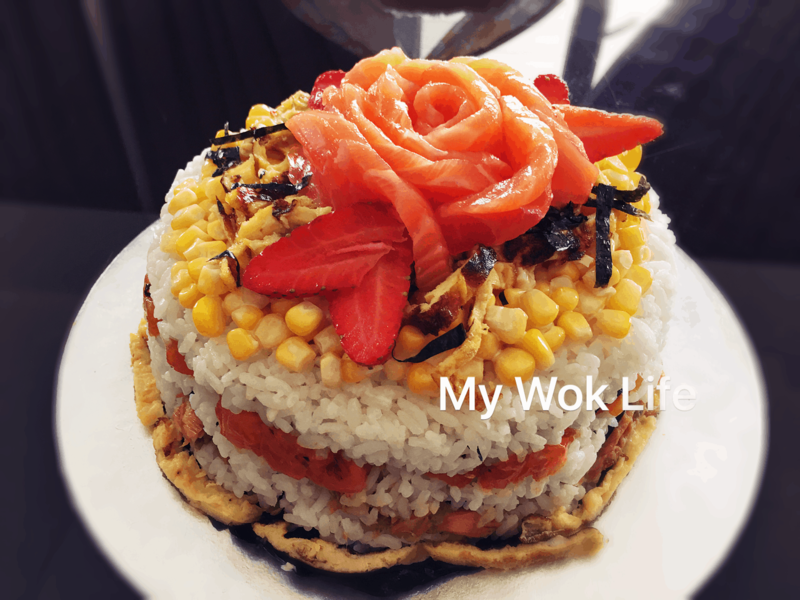 (9) Assemble salmon sashimi slices into rose. Start with the center by rolling up a slice of salmon, place in the center. Wrap salmon slices around to form petals. Lastly, sprinkle shredded seaweed and decorate with strawberry slices and tomatoes. Keep in refrigerator until ready to serve. 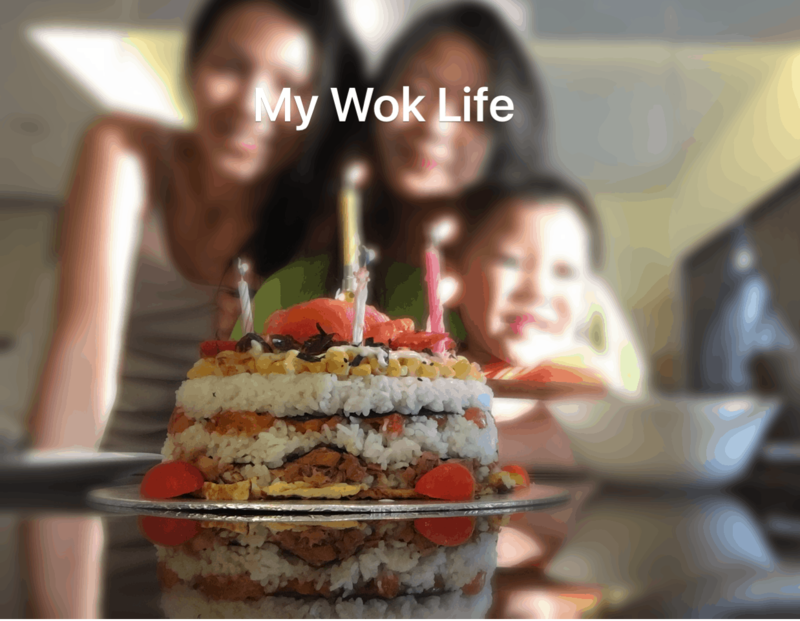 Sushi cake making is kind of versatile. 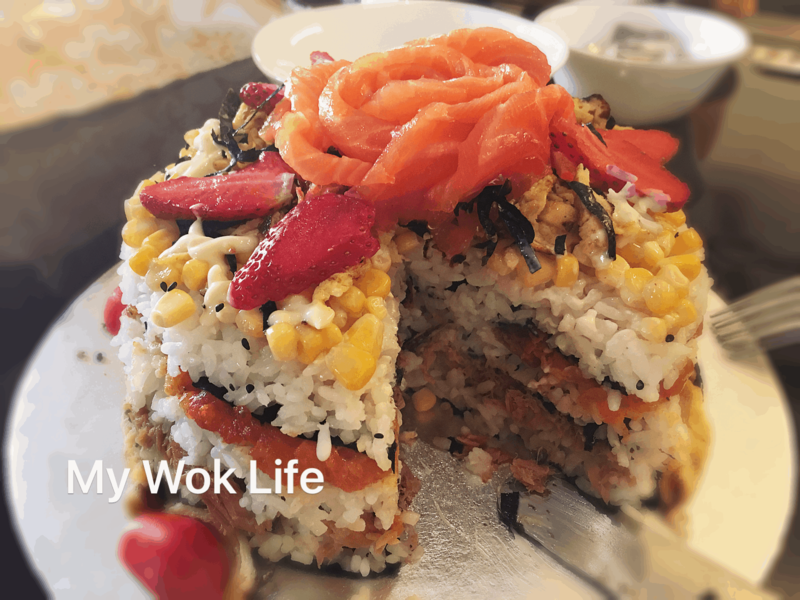 It can be made with different fillings and decorate with any toppings that you liked. My version is made based on our preference. Spicy raw salmon for the elder versus sweet flavoured cooked salmon for the younger. As for myself, I loved it with chicken luncheon meat. So, I actually added some into it. 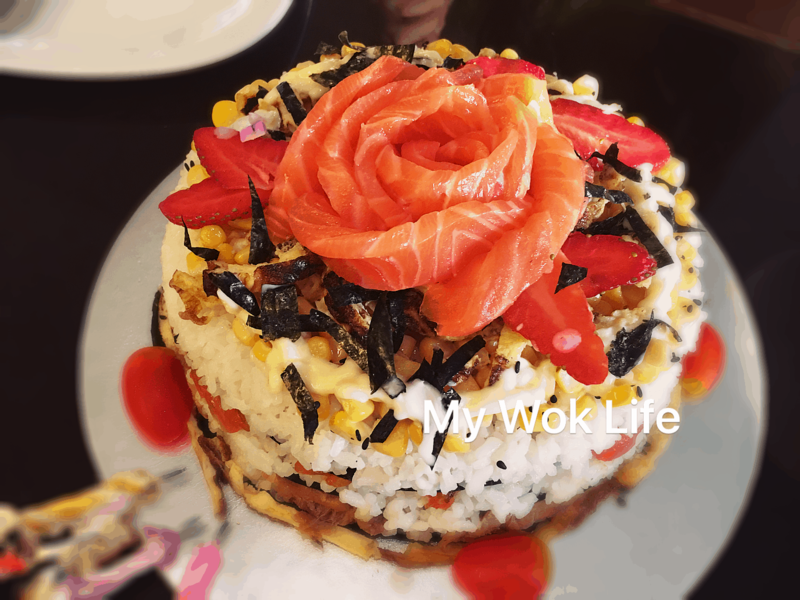 If you liked, avocado, cucumber, salmon roes and tuna are the great choices for making sushi cake, too. 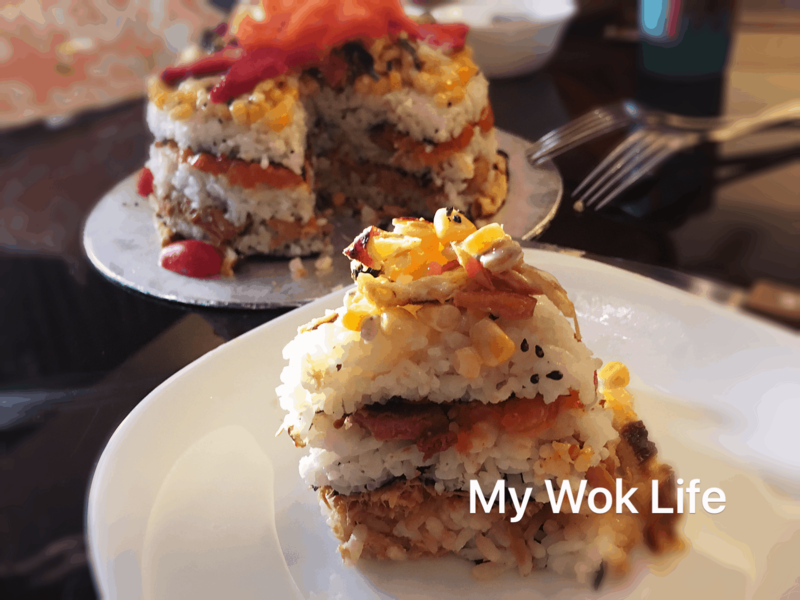 A serving of my sushi cakes counts about 500kcal. Tips: Get salmon sashimi from Japanese food store or restaurant that meant to eat raw. Do not use the supermarket chiller type which meant for cooking. * For teriyaki salmon filling, add sugar into the cooking in batches. Slowly add to adjust sweetness of the sauce to your preference. I cooked it sweeter for my children. * Shicimi seasoning powder is available at major supermarkets (Japanese product shelf), and Japanese product stores eg Daiso. * Decorate with more mayonnaise, if desired.